In today’s world, it is almost impossible to meet a person who doesn’t have a cell phone. Many households own computers and more activities are done online. Technology has become embedded into our society and it has touched many different areas of our lives. One of the industries it has changed is the dental world. 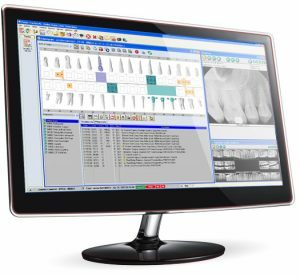 At Coventry Dental Care, we pride ourselves on knowing the ins and outs of what technology can offer to our patients. Our goal is to provide you with dental care that is effective and efficient. If you’re interested in making an appointment with a dentist that is experienced in digital dentistry, then take the time to contact us. Our office is committed to keeping up with the latest advances in dentistry, in order to provide our patients with the best possible outcomes. Have a look below at the technology that we employ in our practice. We are proud to say that we are a paperless office because it creates an atmosphere that’s much more organized and private. All of our charts are completely digital, which creates efficient systems. We do not use paper records of any sort, which means we’re not wasting any resources nor will we ever have to worry about losing any information. All of our notes, images, radiographs, and patient communication is stored electronically. This makes our office efficient, eco-friendly, and highly reliable. If you’re a new patient don’t forget to have a look at our digital forms, but there is nothing to fill out prior to your appointment . Gone are the days of getting a phone call in order to confirm your appointments. Our practice software will email and text you in order to keep you in the loop. All you have to do is click on the link in order to let us know we will have the pleasure of seeing you soon! Also, if you are busy and cannot find the time to phone our office, feel free to text with us. Our goal is to make coming to the dentist as easy and efficient as possible. We know how busy you are, which is why we’ve managed to create many portals of communication to ensure you are receiving the information you need. Many patients remember having a tray full of soft material used to capture a model of their teeth. This is no longer the case. The Trios scanner is a high-definition camera that creates a virtual model of the patient’s mouth. 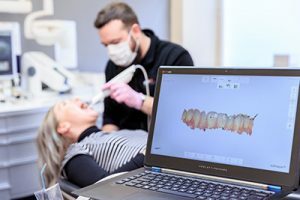 Not only is this a very accurate method of obtaining impressions, patients find this to be easier and more comfortable than conventional methods. In addition, it saves us times, contributes to our paper-free environment, and is eco-friendly as no physical materials are used in the process. If you’re interested in coming to see an efficient, professional, and digitally-oriented dentist, then it’s time to reach out by scheduling an appointment today. We look forward to providing dental care at your convenience.